Geeks are those people who are considered by others as ‘beings of high intellect and those who pursue their interests with eccentric passion’. These people love to flaunt what they believe in and trust me, the tattoo world is full of geeky motifs that are very popular among the rest of the masses. Let me give you an idea of how these geeky tattoos look as I get ready to list down the top 15 geekiest tattoos of all times. 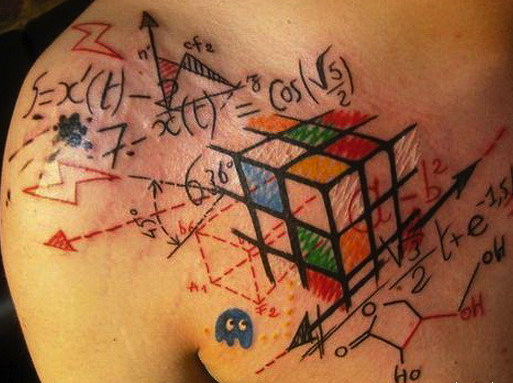 Geeks like maths like no one else on this planet and love to ink sums and algorithms on their bodies as well. 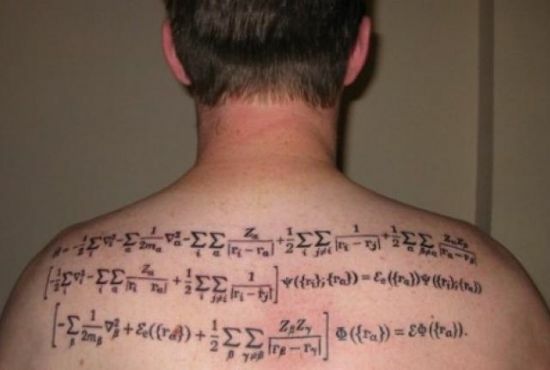 The geek seen below sports a back algorithm tattoo design that looks pretty neat and shows his intense love for the subject. It is inked using black and spreads across the upper portion of the back. QR codes are very fashionable to look, so says the geek in every person that loves how the black squares with dots blend in within a square grid with white background. 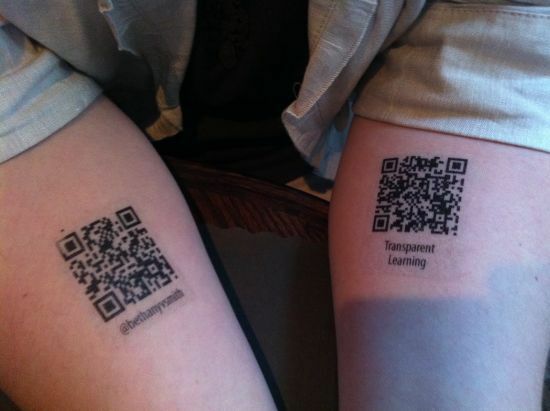 These are the newest entry in the tattoo world after bar codes went out of fashion. All these codes convey a certain meaning and can be read using a camera or any other imaging device. Seen on the hands of this person are inked two black QR codes, each interpreted differently. In case you love a board game and its evil character with intense love, it is a geeky idea to get yourself inked with it. This is what this woman has done to her arm. 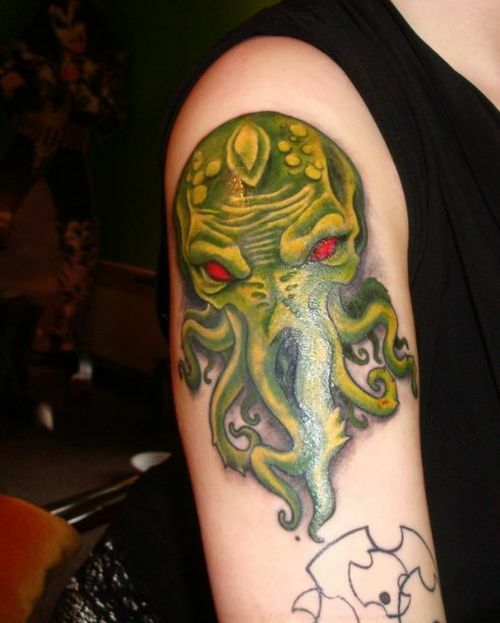 She has gotten Cthulhu, a green monster, a favorite evil character that spoils the board game inked using bright green color. The eyes of this minster are carved in blood red that spook you out for a minute. I am an avid fan of the Hitchhikers Guide series but have never had an inkling that geeks can go all the way out to get their favorite character or name of the book carved right on their bodies. The arm of this person, supposedly a geek, is carved with ‘Don’t Panic’ with a funny looking monster’s head wagging its tongue at the viewers. The design is humorous and brings out laughter. Cyborgs are much loved subjects, specially the geeks that adore them. 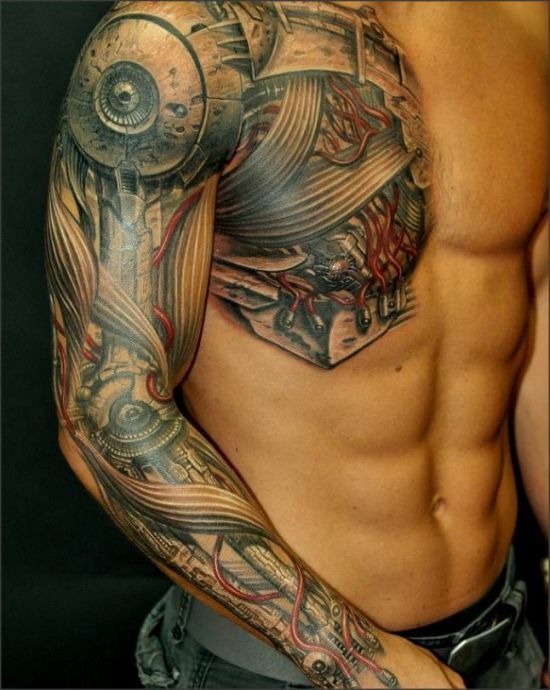 Here is seen a cool and realistic looking cyborg tattoo design inked on the man, starting from his upper part of the chest and going all the way down to cover his sleeves. The right part of his body resembles a robot. The work has been done with perfection and it really looks as if the man is a cyborg! 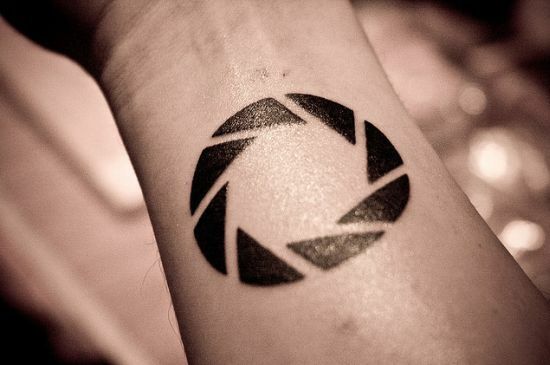 Geeky tattoos look cool, but rarely have I come across a design that serves some useful purpose. 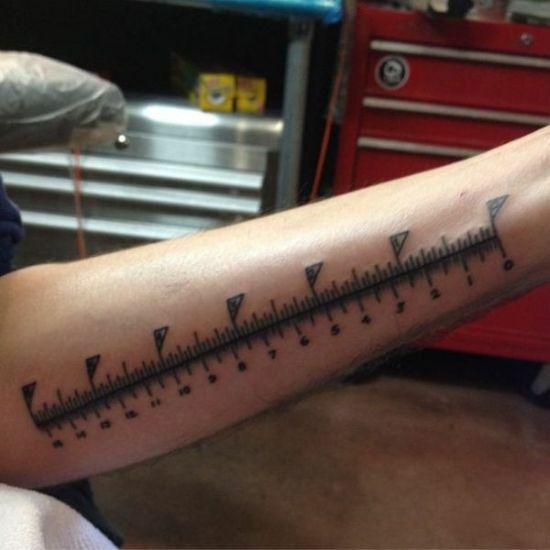 The ruler tattoo design in the image is not just a pretty tattoo but also helps this geek measure anything that is lesser than sixteen inches in length! It is the most handy or workable tattoo to be seen and is inked keeping all the calculations in mind. The tattoo design shown below has blended in the two most unmatched subjects, aka, a Greek goddess(Pandora) and pathogens together in such a consistent and coherent manner that we are left awestruck at one glance. Pandora is shown opening her famed box to release pathogens or viruses outside. Looking at the design, no one would come to know what the floating things actually are, unless they are geeks and know it all! 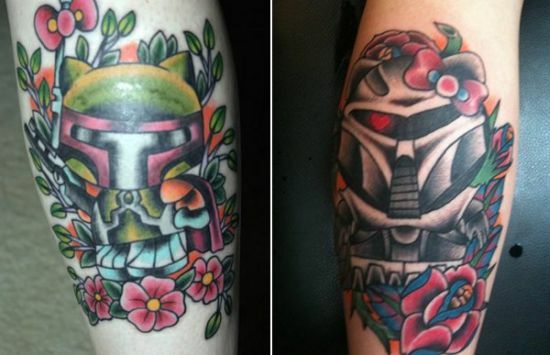 How would you find a tattoo that combined the queen of all cartoons ‘HELLO KITTY’ and a ‘Mandalorian’ warrior from Star Wars, so effortlessly that made you smile from one corner of the mouth to another? Well, here is that Eureka moment when the ‘geeky tattoo kingdom’ gets to crown its most coveted design! The tattoo looks very colorful and funny. 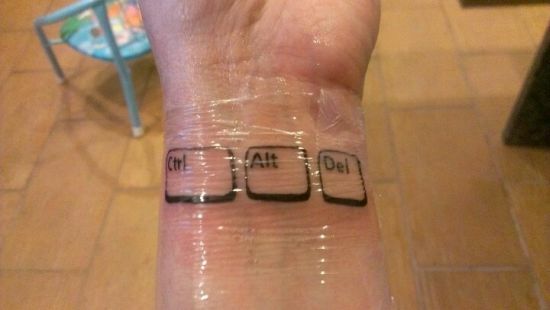 This tattoo is totally for the computer literate and enthusiastic geek that cannot bear to stay away from it. That is why he has got this Ctrl ALT DEL buttons inked on his wrist to remind himself that its always best to restart what has been left unfinished. A very inspirational design, it would be loved by non geeks too! 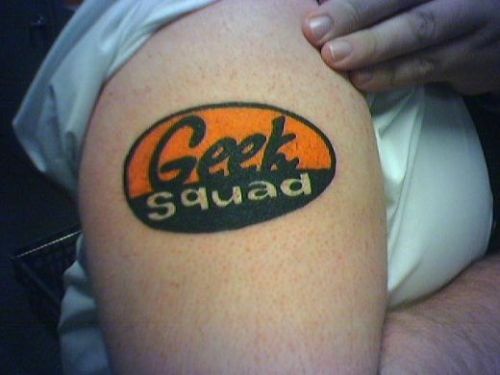 The man sporting this cool oval shaped tattoo bearing the name ‘Geek Squad’ is definitely a geek that finds pleasure in associating himself with a club that takes only such intellectuals as members. The design is divided into two parts, with one part inked in bright yellowish orange and the other in jet black. 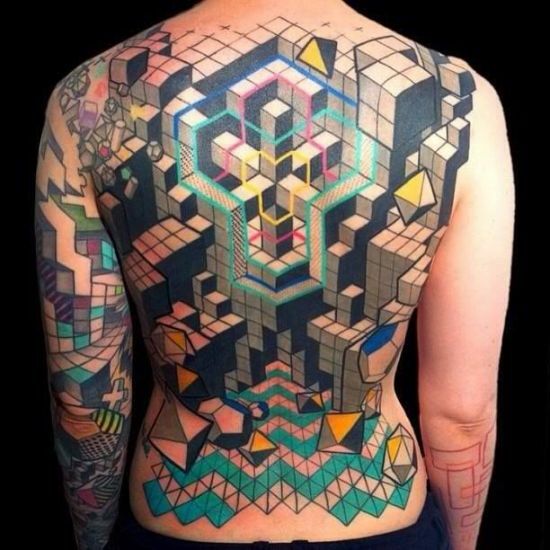 The whole back of the person is designed with the famous online game Tetris that we have played in our childhood. The motif looks attractive as it is a complex design involving numerous geometric shapes that would have taken a very long time to ink. On one look, you can fathom how difficult it would have been to carve this tattoo on the man’s back. Mario is a computer game we all have played as kids and some people still have love for this hero and don’t mind inking him on their bodies. Seen here is a colorful Mario standing on top of a tortoise with four hands, each holding an object. 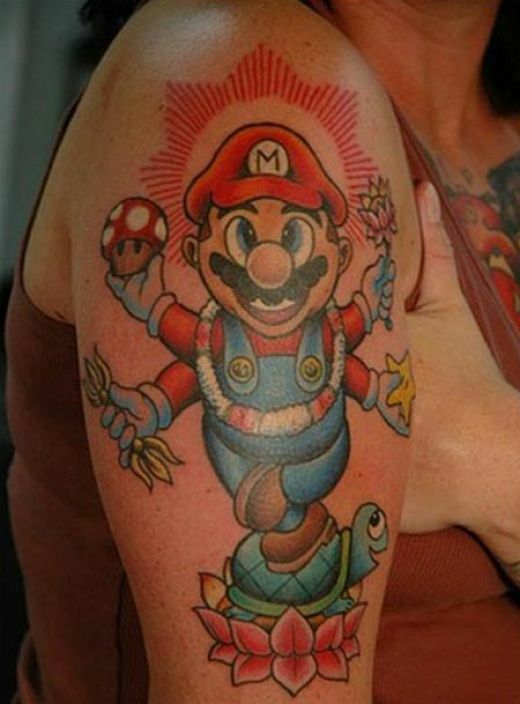 The inked Mario resembles a Hindu goddess who rides a carrier in the form of a turtle and has several arms just like the goddess. 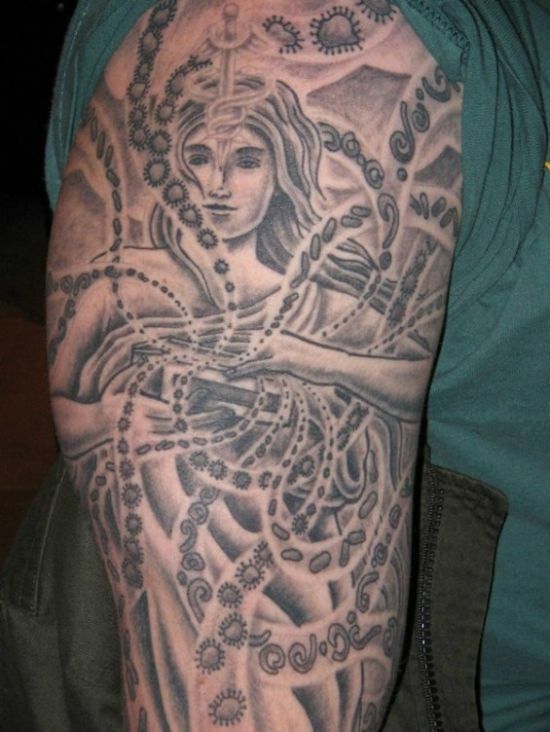 The tattoo looks very funny with all the decorations resembling a goddess. Harry Potter is a famous geeky boy wizard and is much loved by people who worship this hero and his powers. 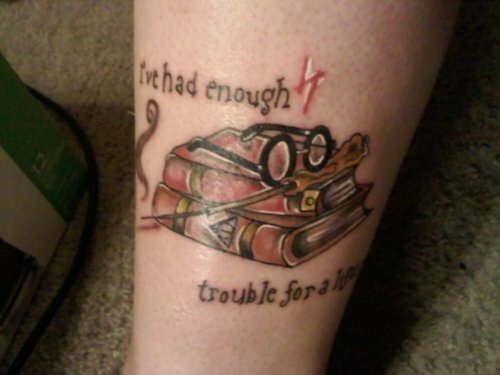 The tattoo looks quite geeky with the motifs of books, Harry’s roundel glasses and the famed magic wand. It is a little different design since most of the Harry Potter tattoos come with the wizard’s face as the main motif. This tattoo is perhaps the geekiest of all that have been listed here. Rubik’s Cube has been inked using a number of bright colors along with many mathematical calculations that conclude that the man wearing this cool tattoo is an ardent lover of such complex games. The cube is shown with various calculations and the very look of it makes you dizzy headed! The wrist in the image is inked with a black shutter of a camera and looks very geeky indeed. The shutter, on one look seems something else, but it only takes a fraction of a second for a geek to recognize and correlate it with a camera. The black color used to carve this design adds to its attractiveness. 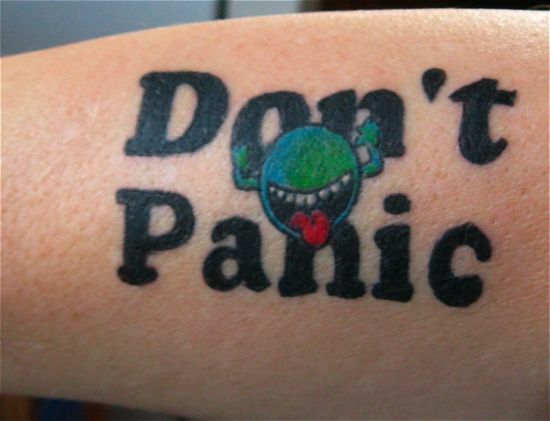 The list above contains the top 15 geekiest tattoo designs that are loved by everyone. These tattoos can be inked by anyone who has a similar kind of fetish and am sure these will help you select the best for yourselves. Please read on to make the most out of it for you never know when the ‘geek’ in you gets inspired!